Acura of Limerick is your trusted Acura car dealership near King of Prussia, PA, and your premier destination for the best car-buying experience in town. Our fleet of Acura cars for sale is expansive and varied and today we’re highlighting the 2018 Acura MDX. This fantastic SUV scores high on comfort, safety, and performance. 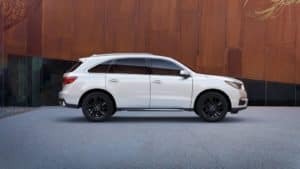 The 2018 Acura MDX is stylish, luxurious, and everything you could ever want in a premium SUV. It sports a featured 3.5-liter 24V SOHC i-VTEC V6 engine that gets 290 horsepower when paired to the nine-speed automatic transmission, and has automatic full-time all-wheel drive. Things are made even smoother and more satisfying thanks to the available automatic ride control adaptive suspension too! The 2018 Acura MDX isn’t just a strong performer, this vehicle gives you loads of safety and entertainment amenities as well. Some of our favorite safety features include ABS brakes, lane departure warning, lane keeping assist, and a back-up camera. All of these fabulous features and much more are on hand to give you confidence and peace of mind behind the wheel. Don’t worry that the 2018 Acura MDX has forgotten about your fun and comfort either! Some of the many highlights found onboard include dual-LCD monitors, Bluetooth® connectivity, multi-zone auto-climate control, and available leather seating. So much to love indeed! Acura of Limerick invites you to join us today at our convenient 77 Autopark Blvd. location. Our friendly staff is standing by now, eager to assist all of your needs. We’ll showcase the brilliant 2018 Acura MDX for you, get you set up with a test drive, and have you driving off the lot with a smile on your face in no time! We hope to serve you soon.